Student achievement is much higher if the affects of poverty are factored in, says the folks at The Center of Michigan, a non-partisan think tank. 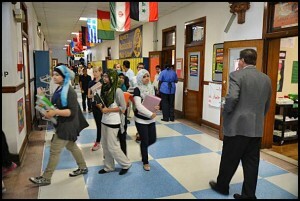 For the second year in a row, Hamtramck’s public school district is doing better than the Michigan Department of Education says. According to the MDE, the school district is lingering under the 10 percentile compared to other districts. But the MDE just looks at test results. That’s not the case with the folks at The Center for Michigan, a non-partisan think tank. This group factors in the city’s poverty rate and the number of students who receive free or subsidized lunches. Some 84 percent of the district’s students get free or partially subsidized lunches. There are 2,897 students in the district. Using that calculation, and other factors, Hamtramck’s public schools rank 244th out of 540 districts statewide. The state indeed is threatening to take over low-achieving schools and districts. In cases where it has, the districts have been turned into charter schools, said district attorney George Butler.